Owing to low entry barriers, the global driving apparel market is highly fragmented, according to a recent business intelligence publication by Transparency Market Research (TMR). Local and regional players are offering products that may not be of optimum quality but they are much more affordable for larger masses, particularly in the emerging economies of Asia Pacific. That being said, a small pool of well-established players are ahead of the curve too, holding a prominent position on the back of their high-quality products and strong distribution network. The report identifies PUMA SE, Scott Sports SA, Alpinestars S.p.A., Fox Head Inc., Dainese S.p.A., ThorMX, and Adidas AG as a few players who hold notable chunk of shares in the global driving apparel market. To maintain their moderate position of strength, most of these key players are focusing on product innovation as well as improvements to their popular products. As the concept of wearable is harnessed further, the vendors of this market are expected to adopt the new technologies and gain shares over their competitors. As per the projections of the TMR report, the demand in the global driving apparel market will multiply at a CAGR of 5.3% during the forecast period of 2017 to 2025. 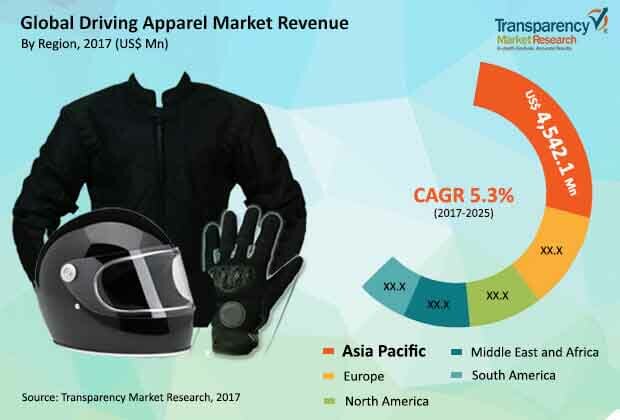 In terms of revenue, the opportunities in the driving apparel market, across the globe, is estimated to reach US$18,565.0 mn by the end of 2025, substantially more than market’s evaluated worth of US$12,312.5 mn in 2017. The analysts of the report have also anticipated quite a few mergers and acquisition to unfold during the forecast period, which not only helps the companies to expand their geographical presence but also aids in enhancing product portfolio. Based on product type, the driving apparel market has been segmented into clothing, footwear, and protection gear, whereas on the basis of material, the market has been bifurcated into leather, synthetic, and natural fiber. The TMR report also classifies the market for driving apparel market on the basis two wheeler and four wheeler. Geographically, Asia Pacific has been highlighted as the most profitable region, although North America and Europe are foreseen to expand the demand at a much strong rate over the course of the forecast period. Increasing number of driving enthusiasts is the primary driver of the global driving apparel market. While Formula One continues to grab strong attention from fans and breeds the next generation, lesser known racing sports such as IndyCar and MotoGP have gained popularity in the recent past. All of these Motorsports require the players to follow strict safety measures and are providing for a strong traction to the global driving apparel market. In addition to that, on the back of increased disposable income of urban populations in emerging economies, ride for pleasure trend has emerged, particularly in the two wheeler segment. Consequently, the demand for elbow caps, gloves, knee cap, and protective jackets is expanding. Moreover, a number of governments have employed strict regulations for safety on the road and encourage the adoption of basic driving apparel such as helmets. Introduction of advanced materials like fiberglass reinforced plastic and carbon fiber have made helmets lightweight and useful. Additionally, manufacturers are continuously focused on integration of electronics in protection gear and development of helmets with head up displays, which is likely to increase the demand for these accessories even further in the future.